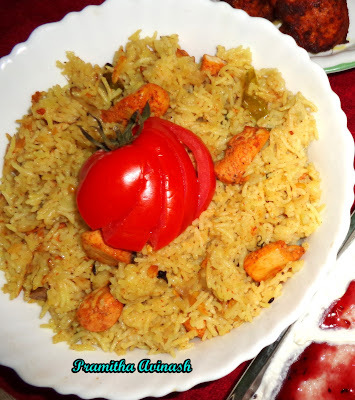 Pulao is an Indian dish,which is very easy to prepare.It is a rice-based dish which often also includes ingredients like vegetables or meat. This is a delicious aromatic chicken pulao bursting with rich flavours of whole spices and chicken.This can be served as the best main course dish.And it is very easy to cook than a biriyani.Biriyani takes lot of time to prepare.Both tastes great.But pulao will be ready within 15-20 mins.Please do try this delicious recipe and let me know the result. 3. Heat oil in a vessel,and add cardamoms, cloves ,cinnamon ,fennel seeds and bay leaf and saute it for a minute.Then add the sliced onion and saute it till brown color. 4. 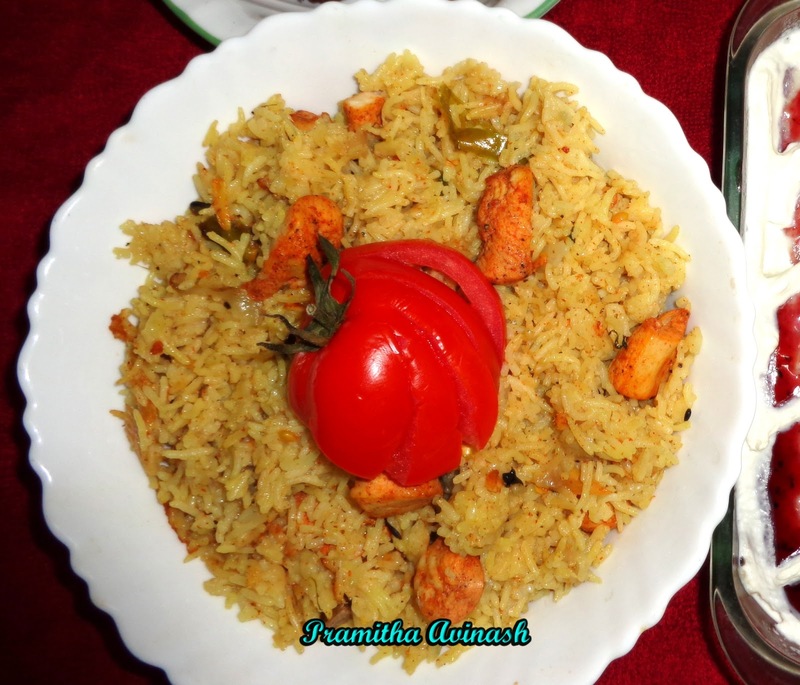 Add the marinated chicken pieces to it and cook for 8- 10 mins by stirring.Then add the rice and fold in the rice carefully without breaking the rice. 5.Add coriander leaves and mint leaves to it.Mix all the ingredients well. 5.Now add the boiled water and lemon juice and check the salt,if needed add salt according to your taste. 6.Bring it to boil on high flame, cover the vessel tighly and cook it for 15-20 minutes with low flame until the rice and chicken is fully cooked and all water has been absorbed. 7.Open the lid and keep it open for 5-10 mins so that steam goes out. 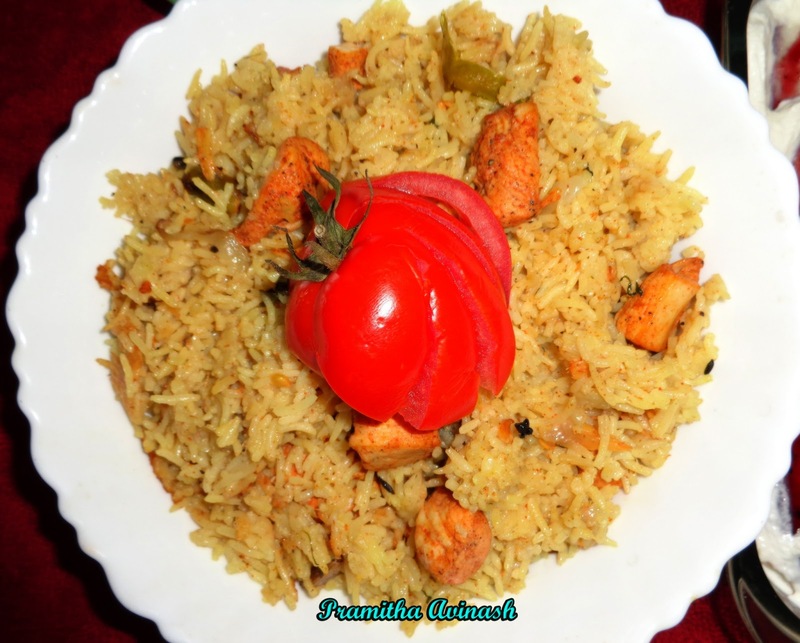 Aromatic flavorful chicken pulao is ready to serve.Garnish with chopped coriander leaves and mint leaves.